Bellew vs Haye Rematch is confirmed following Haye's injury. 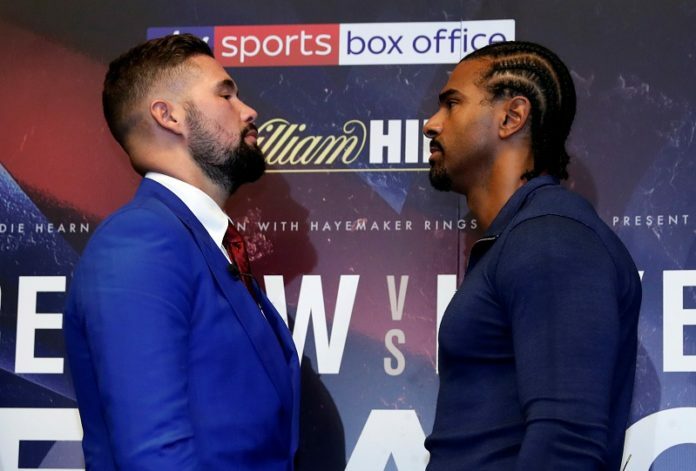 The much-anticipated rematch between Tony Bellew and David Haye will take place on Saturday May 5th at The O2 arena, London, Live on Sky Sports Box Office. Haye and Bellew were set to renew hostilities on December 17th, however the fight was postponed after David Haye injured his bicep in a freak accident. Tony Bellew commented: “I’m pleased to get a new date in the diary and I look forward to giving boxing fans a great night on May 5. To be honest I was looking forward to a great victory in December and a relaxing family break over Xmas but my mind is still very much on this fight and I will punish him for that. David Haye commented: “I’m thrilled to confirm that The Rematch between myself and Tony Bellew will take place on Saturday 5th May, returning to The O2 Arena. Whilst the first chapter of the Haye Bellew saga didn’t go my way, fans were left on the edge of their seats throughout the thrilling eleven round battle. The Rematch in May will no doubt eclipse this, Tony has boasted that The Rematch gives him the opportunity to force me into retirement. Unquestionably, I step into the ring on Saturday 5th May with both my career and legacy on the line. After my freak accident down a stairwell last month I was heartbroken not to give everyone the ending to 2017 I wanted. Since then I had to accept the cards I had been dealt, remain positive and focus on factors which are within my control; rehabilitation and rescheduling the fight. Over the past five years, I’ve had a number of challenges to overcome, but learnt often during times of adversity we learn and grow. As a result, come May 5th, Tony will be faced with a more experienced and more determined opponent. On Saturday 5th May, whether you are lucky enough to witness the showcase live, or tune in from home on Sky Box Office, you will not be disappointed. I will give fans the ending I have promised. Tickets for the original 17th December date are still valid for this event. If you require a refund, please contact your point of purchase.